From developing the Miracle Field in Wilmington to helping child trafficking victims in Costa Rica, UNCW faculty, staff, students, alumni and friends are making their communities and the world a better place. The spring issue of UNCW Magazine takes a look at the university's impact on the community, the state and the world through volunteerism, service learning, philanthropy and entrepreneurship. "We're excited to showcase a small example of the depth of commitment Seahawks have to making a difference," says Marybeth Bianchi, UNCW Magazine editor. "There are so many stories to tell at UNCW." This is Bianchi's 20th year editing the magazine. 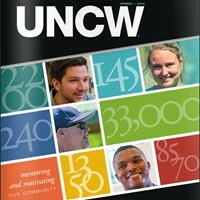 She considers it an honor to share the stories of UNCW with the community. "Putting together each issue reminds me of the qualities that define UNCW and the people who call themselves Seahawks," she says.